Have a special something for waffles that no other dessert could ever compete with? Head over to an all waffle place, 9 waffles that is going to make Bandra residents very, very happy. 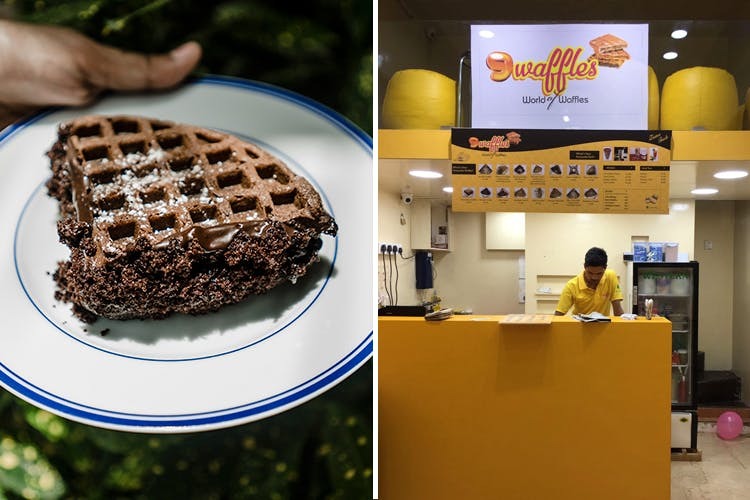 Behind Bandra’s San Churros Chocolateria, another yellow shop has joined the dessert brigade and it’s whipping up solely waffles. 9 Waffles has been in Mumbai with its first outlet at Charni Road, and has now opened on Waterfield Road. Confuse your sweet tooth with a multitude of options as they definitely serve more than just nine here. Some unique items on the menu? Blueberry cheesecake waffles, orange chocolate waffles, waffles with caramel in them and even waffle with dairy milk pieces inside it. We ordered a dark chocolate brownie waffle, which was a waffle sandwich with chocolate sauce gluing it together, and crumbly chocolate brownie. It was extremely sweet and delicious, just the thing we needed to kick start our day. The basic waffles start at INR 120. The dark chocolate brownie waffle cost us about INR 180. They also deliver if the order is a minimum of 3 waffles, so convince your family, friends or colleagues and call these home on the weekend. Your stomach will thank you for sure.